The above image shows the earthworks with their banks and ditches and the South West corner in the stone ‘circle’ of Avebury Henge. The same corner of the henge shown at the top of the page can be seen at the bottom of this satellite view of Avebury. The surviving stones and Alexander Keiller’s small concrete markers for the missing ones in between them are visible in the photograph. The images I used for my geometrical analysis needed to be of much higher definition than the one shown above, so I was pleased to be given a graphics document created by Steve Marshall in the course of his research for his book Exploring Avebury; The Essential Guide. Steve had added invaluable optional layers to his aerial view including a layer of spots showing the missing stones. The original positions of these were sufficently well known from the areas of detected socket residue and their general pattern of spacing to make possible the type of geometrical analysis I needed to do. 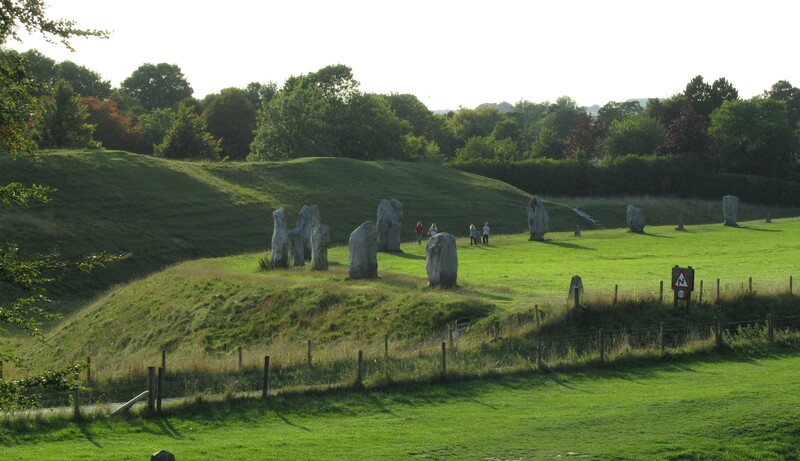 A number of people have made attempts in the past to understand the geometry of Avebury Henge but these have not identified a consistently meaningful centre, which I have been able to do. Also, although it is obvious that the henge is not round, the fact that we think of it as a ‘stone circle’ has effectively blocked perception of the many straight lines. Even Alexander Thom, whose survey of it is still considered to be the most accurate ever done, and whose drawing fits accurately over the above aerial view, read these straight lines as shallow curves despite having the stones in the right place in his drawings. Alexander Thom nevertheless recognised the presence of engineering in these stone circles, having trained as an engineer, and he remained firmly convinced of this even when many of his peers in the world of archaeology ridiculed him for his ‘wishful thinking’ over his Megalithic Yards. But he did all his surveying work from the ground and so I cannot help wondering, had he seen an aerial view, would he have noticed the straight lines? In the age of satellite, aeroplane, drone or even helium balloon photos and of computers with finely detailed graphics software a visual artist whose eye needs no words to see with, and to whom everything is geometry anyway, has an advantage in analysing a site like this. I love geometry, rhythm, pattern and proportion. I feel my way through them because that is my nature as a sculptor, and sculpture is essentially a nonverbal activity, so once I looked at this overhead view of Avebury no words or concepts blinded me from seeing the straight lines in the ‘circle’ or placing a true circle over it by eye where it correctly fits and finding the centre. Once you have lines and a centre you also have angles and geometry. Geometry is generated as much in the rhythm and movement of a dancer as in the calculating mind of a mathematician. I am one of those artists who experience it by alternating continually between these two modes. Having established a centre for Avebury and noticed the straight lines in the outer circle I set about playing and experimenting with the geometry. As soon as I started this the whole thing came to life in my hands in a way that far exceeded any prior expectations I may have had. I kept getting such extraordinarily improbable results and so many regular polygons by cycling the lines round the circles that I carried on for two years with different permutations of these amusing games of Spirograph. Through them I gradually refined the precise position of the centre to the one fixed point that worked best for all of the shapes. I had the excited feeling that I had found something big, and which was very unlikely to be due to chance alone. But where could I start to decipher it? It was a long journey!